Virginia T. Coleman is an artist residing in Denver, Colorado as a member of the Next Art Gallery. 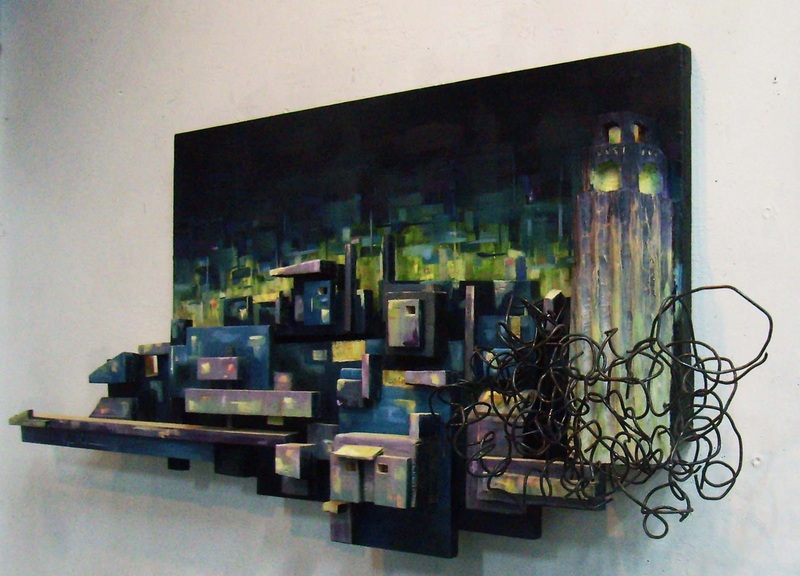 She holds an MFA from the Academy of Fine Arts in San Francisco, as well as a Bachelors of environmental design from the University of Colorado at Boulder and a Masters Certificate in welding from the Tulsa Welding School. Her artwork can be found online at http://www.virginiatcoleman.com. 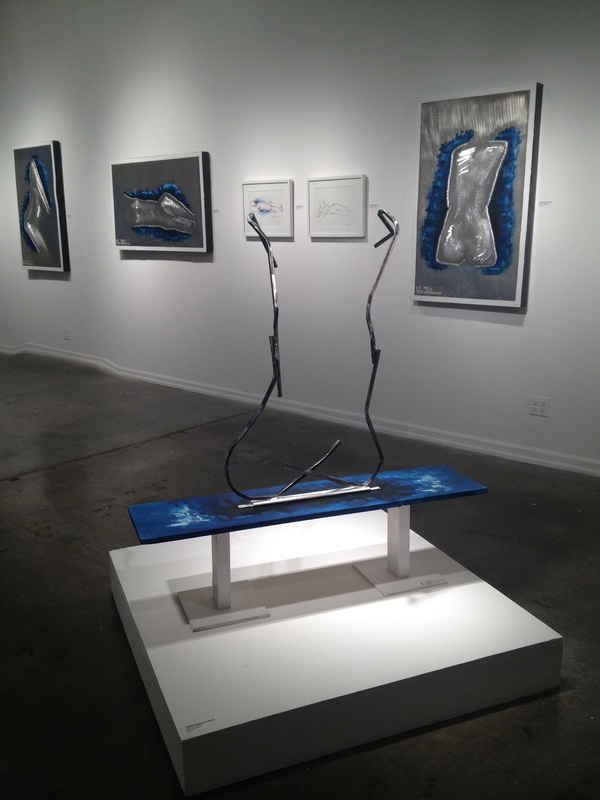 Here is an installation photo from Virginia T Coleman’s recent exhibition, The Lines of a Woman. Take us through the process of making your work. How do you balance painting with metal? My approach varies depending on the type of work. 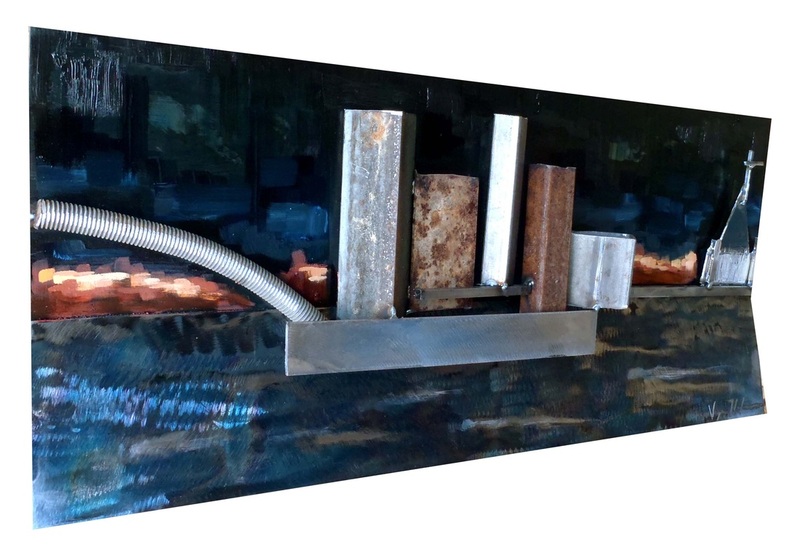 When it comes to the more conceptual, abstract pieces of my metal art, it begins randomly. I say that because I usually will just be staring at a pile of metal or some scraps I might need to use up, and I begin to arrange them compositionally. This then will lead me to begin to think of a concept that will drive the final arrangement of the elements. The finished product is an exercise in taking the abstract and morphing it into a tangible concept. If it is a predetermined concept that is larger and more complex in scale, I will begin with a doodle and then a scaled model. The model is usually made out of cardboard to scale so I can think quickly, make changes, add and subtract color before I begin to fabricate it out of metal. Once you begin working with metal, you quickly recognize how you can do something to metal that will take you hours to correct and sometimes correction is not possible. When I work with metal, I try and use the inherent characteristic of the material before I begin to even consider adding my own personal color. Some pieces in the end require very little added manipulation. others need color to be added. Whichever way the work wanders, I try to make my decisions slowly and methodically. Out of your metalwork, paintings, and photography, which medium do you find the most challenging? I find challenges out of all the mediums; however, they all fuse into the medium to which I most desire to master, metal. I recognize, however, that I can never master metal because metal is such a dynamic, living entity. Metal gives me challenges everyday through my job as a professional welder to my work as an artist. Metal has become my life challenge. 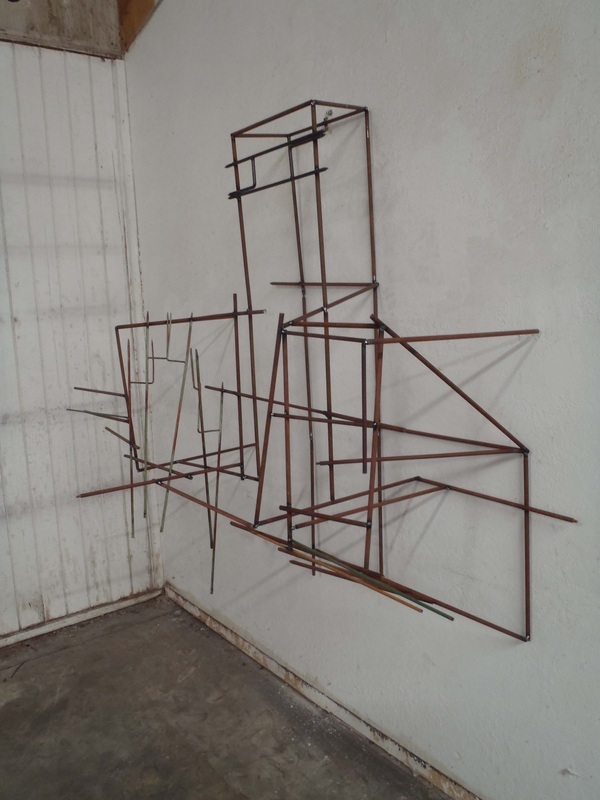 Could you explain the connection your work seems to have to architecture, both conceptually and materially? 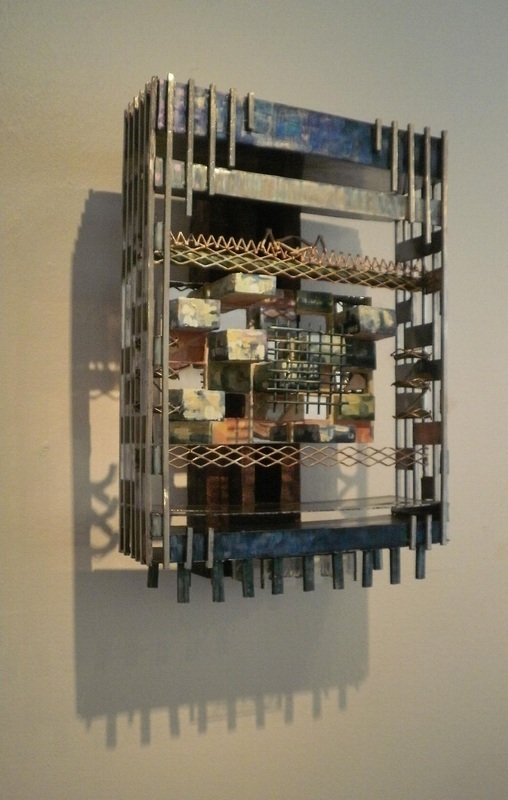 Architecture is really the basis for every aspect of my art. I was trained as an architect first, a fine artist second, a sculptor third, and craftsman fourth. With that being said, I have been enamored by buildings since childhood – the pure power yet delicate embrace a building has on the context of our environments. Buildings are the wallpaper, the tunnels, the dreams, the horror and the magic of our world. Architecture is a platform for taking a concept and morphing it into a tangible, inhabitable object. My architecture training taught me how to draw, to doodle, to think outside the box, to find parallels in seemingly disparate trains of thought, and to dream larger than life. It seems very logical to me today as a metal sculptor that my material of choice should have always been metal, but I didn’t see that link as clearly as others. It wasn’t till my late twenties that I took my first welding class, and I have never glanced back. I am utterly fascinated by metal and steel structures. The pure power which the material possesses is humbling and its delicate ability to weave together, a technical challenge. It still baffles me the capacity steel has; it can bend across great rivers, cantilever weights into space, or teeter to unimaginable heights. It leaves all of us breathless. When you start to look at metal or at structures closely, you begin to look at the material metal not as an object to build with, but also as a beautiful canvas both inherently and potentially. You can use the rusted autumn of Corten steel, to the shimmery transparency of stainless, to the purple majestic range captured while heating steel, to all metals abilities to be used as a canvas. Metal is a painting in and of itself. So, as I began my career working with metal, I began to take my years as begin trained a painter as a spring board in coloring metal. I grew up in a mountain town in Colorado that was in the tidal wave of major development. My playground became construction sites, and I loved it. I would go around touching all the raw materials and seeing how the whole house was being put together almost nail by nail; it was an educational childhood. I knew from a young age that I wanted to learn how to make objects, to be hands on with the actual physical fabrication aspect of design. Architecture is the thread through all my work. You’re a member of the co-op at Next Art Gallery here in Denver. How would you describe the vibe of a co-op in comparison with a commercial gallery? I was recommended to it by a fellow artist who was telling me how great the gallery space was, so I decided to give it a try. I have not found a commercial gallery that has really grabbed me yet. I hold strong to my freedom to create unhindered by outside influences. I am not opposed to commercial galleries but have not found them conducive at this juncture. With the Co-op, I am learning a tremendous amount about how a gallery is run. I can’t say I ever want to run a gallery. I’ll leave that to others, but it is interesting. I am in charge of reviewing potential new members portfolios. It is fun to see what other artist in the Denver area are creating. Every member has his or her own unique voice and we support and encourage all of the members to push their art. 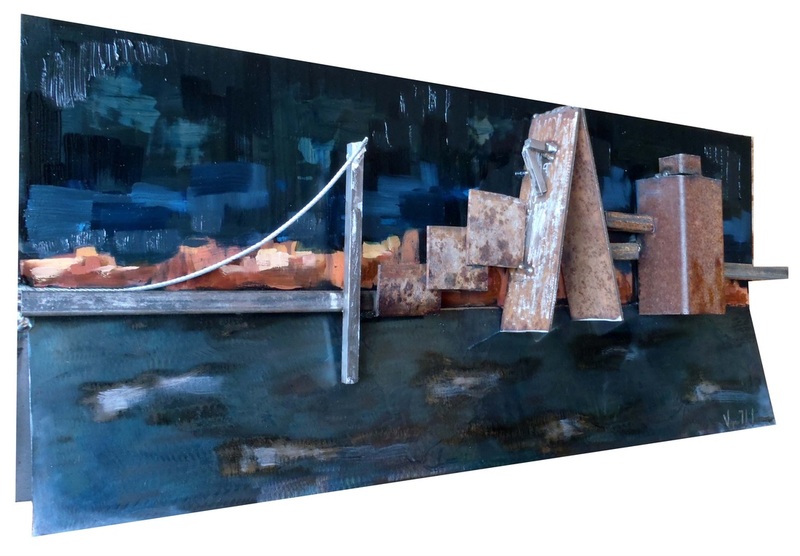 Please view Virginia T Coleman’s artwork online at http://www.virginiatcoleman.com/ and “like” Critique Collective on Facebook at https://www.facebook.com/critiquecollective.